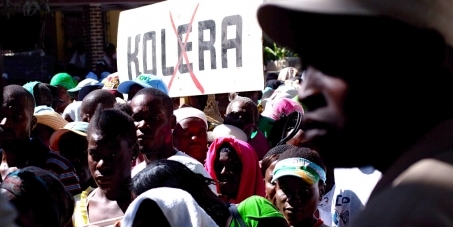 End Haiti's Killer Cholera Epidemic -- UN Action Now! This petition has been created by Robert N. and may not represent the views of the Avaaz community. The people of Haiti are fighting a deadly cholera epidemic introduced by UN troops that has killed thousands and sickened hundreds of thousands more. Since it caused this catastrophe, let’s push the UN to help Haitians stamp out killer cholera for good. Since it began in October 2010, cholera has killed nearly 9000 and brought untold suffering to poor Haitian communities. Although doctors, scientists, and even UN Special Envoy Bill Clinton recognize that UN troops brought the epidemic to Haiti, the UN has refused to take responsibility. Following months of pressure from grassroots movements in Haiti and around the world, UN Secretary General Ban Ki-moon announced on December 11, 2012 that his office would support a $2.2 billion plan to eliminate cholera with medical treatment and water and sanitation infrastructure. Two years later, the initiative has secured commitments covering merely 18% of the plan’s total price tag. At this pace thousands more Haitians will die before their communities receive clean water. Nearly five years have passed since this deadly epidemic first broke out. To avoid any further delay in saving lives, the UN must move quicker. Secretary General Ban Ki-moon should secure the funding needed to build vital water and sanitation infrastructure accessible to all Haitians now. The Secretary General should ensure that this funding is transparent and that the Haitian government and impacted communities play a central role in every step of the implementation of the plan to eliminate cholera. We have no time to lose. Cholera cases have surged in the last few months. Together we can save lives and help Haitians finally rid their nation of this killer, if we act now. Sign this urgent petition and share it with everyone you know. We'll deliver it directly to the Secretary General. Oliver Stone is an award-winning filmmaker, director most recently of the documentary series The Untold History of the United States on Showtime, and director of JFK, Nixon, Wall Street, Platoon, and more. Just Foreign Policy is a non-profit, non-partisan membership organization working to reform U.S. foreign policy so it reflects the values and interests of the majority of Americans.